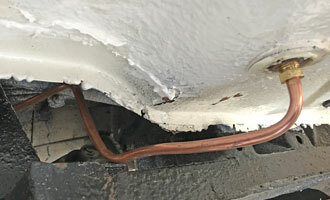 All the fuel lines have been replaced with the exception of the original lines at the engine. I have used copper (for specification see table below) for the fixed lines, and PTFE for the flexible lines (reinforced with stainless steel mesh, and with stainless clips). Pipes are 5/16" in internal diameter from the fuel tank to the fuel pump, and 1/4" internal diameter from the fuel pump to the carburettors. 6mm x 0.8mm C106 BSEN12449 seamless copper round tube (min. Cu content 99.90%). Copper : M7621 7.93mm x 0.9mm 5/16 x 20G C106 CW024A BSEN 12449 BS2871 ECT M7621 10:21 210/14 and 1/4"
According to the US Code of Federal Regulations Title 33 Part 183.538 Metallic fuel line materials should be made of seamless annealed copper, nickel copper, or copper-nickel; and have a minimum wall thickness of 0.029 inches. This means renewing all the old steel fuel lines. 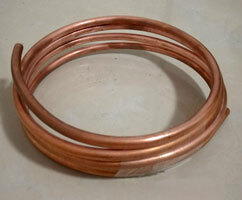 I chose Copper, it is widely used, readily available from Triumph parts suppliers and easy to bend! It is 7.93mm id (5/16") and has a 20swg (0.91mm) wall thickness. Some feel that Copper is inferior to 'Kunifer' (Copper Nickel) but I was reassured by an email from Automec that this was not the case. To see this click here. For the flexible lines I chose polytetrafluorethylene (PTFE or, to use DuPont's trade name 'Teflon'). PTFE is a synthetic fluoropolymer that is stable at very low and high temperatures and chemically inert to everything (e.g. Ethanol) except acid . It is also very durable.